Example of rigorous training, wisdom, wit and clear convictions, the scientific prestige of Manuel Albaladejo Garcia knew no geographical boundaries, which ended by consecrating one of the three most renowned contemporary jurists in recent times. Among the many honors, awards and titles he received, he was awarded an Honorary Doctorate from the University of Alicante in 2003, further consolidating his already close relationship with the department of civil law. After his death, last April, at the age of 92, his personal library was donated -by his express desire- to this department that today bears the name of the distinguished jurist. The formal act of donation has taken place this morning at the Law School and has been attended by his widow, the also professor of Civil Law, Silvia Díaz Alabart, the University of Alicante’s President, Manuel Palomar, the former secretary of the University Council and former president of the University of Murcia, Juan Roca Guillamón, the Vice President for Research and former Dean of Law, Amparo Navarro, the UA Registrar, Aránzazu Calzada, and all those who are part of "the UA civilian family". During the ceremony, the civil law professor and director of the Department, Juan Antonio Moreno, visibly moved, has emphasized the personal and academic strengths of Manuel Albaladejo who has been called "the spiritual father of the faculty of law in Spain”. 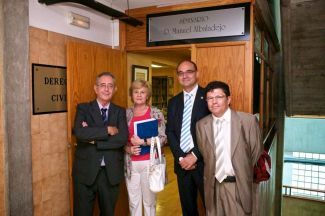 After parliaments, two commemorative plaques were unveiled, one giving its name to the "Civil Law Seminar Manuel Albaladejo" and the other "Legacy of Don Manuel Albaladejo," in which materials will be placed as soon as they get inventoried and cataloged. 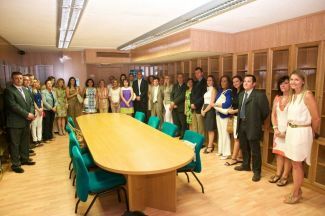 The University President has thanked the trust deposited in the the University of Alicante and has praised the faculty and researchers of the Department, whom he congratulated on their excellent career and national relevance “witnessed –if even more- by the legacy received”. Meanwhile, Silvia Díaz has thanked "the good personal and professional moments" that we all collaborated to her husband at the University of Alicante and has recognized the value of a department that once began as something very small and has become a national benchmark. Among the materials donated, there is an important collection of doctoral theses, private notebooks with personal notes and the enormous work of the jurist, comprising more than fifty volumes, authentic referents in civil law. Professor at the universities of Oviedo and Barcelona, Manuel Albaladejo doctorated in Bologna and Madrid. Among other positions, he held the presidency of the Royal Academy of Legislation and Jurisprudence. He was the Councillor of State, permanent member of the Law Commission, Deputy Director-General for University Planning, President of the University of Barcelona and honorary life president of it. In terms of scientific projection, he wrote over 300 articles, more than 20 monographs and was the master of a vast majority of university professors in civil law.